Crimp Testers for Tensile Strength Testing | IMADA CO.,LTD. IMADA Wire Crimp Testers feature easy-handling and high operating efficiency. IMADA crimp testers are desined to improve your operating efficiency of wire crimp test, reducing entire testing time. Also, the tester can secure various sizes of crimp terminals, enabling you to handle a wide range of crimp terminals in a single tester. You can select from Manual (lever) operation type or Automatic type to fit your needs. If you would like to see the movies of wire crimp test, see Wire Crimp Testing Solutions . 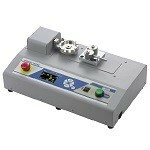 It is a lever operation type wire crimp tester. Pull the lever and measure crimp force after setting a sample. It provides high testing efficiency. The capacity is up to 500N (50kgf). 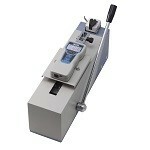 It performs crimp test automatically from testing to storing the data. Destructive test and Non-destructive test are capable. The data acquisition software is included. The capacity is up to 1000N (100kgf).